The charming beach hotel is located in the heart of the historic town of Rethymnon, in the waterfront district along the sandy beach. Surrounded by shops, restaurants, cafes and a lot of tourist activities, the family-friendly design hotel is just 50 metres from the sandy beach and its many sports activities (fees may apply). The bus station is just a 2-minute walk away and nearby airports include Souda (60 km) and Nikos Kazantzakis Airport (78 km).The design hotel offers a cosmopolitan atmosphere with a warm and hospitable lobby in a renovated building which combines state-of-the-art technology in a luxurious and comfortable environment. There are parking facilities available nearby, some subject to an extra fee. 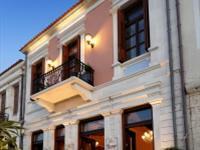 Originally built in 1650, the building now houses an apartment hotel offering 8 rooms in total. Facilities available to guests at the air-conditioned beach hotel include a lobby with a 24-hour check-out service.